# This assignment solution is based on 2018-2019 IGNOU assignment question paper which must submit before 31st March’2019 for appearing in IGNOU June examination & before 30th September’2019 for appearing in IGNOU December examination. # Assignments with good solution help student to gain better percentage because of its 30% weightage in final marks hence we recommend every IGNOU student to write & submit best solutions which is only available here. # All assignments are prepared by professionals based on 2018-2019 Assignment question paper for excellent result. 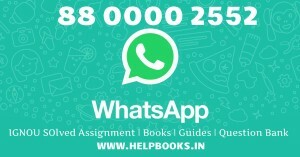 # Helpbooks.in has full money back guaranty in case of any dispute or mismatch and our team is always ready to help any IGNOU students. # All assignments are in instant PDF format which would be send on email/WhatsApp just after a nomination payment. # WWW.IGNOU-Books.com is a verified & secure website since April’2013 to help IGNOU students. All Payment methods are certified by top Payment gateways i.e. PayPal, PayU, PayUMoney and more. # You need to search/select your subject code then add to cart. # Complete the checkout process by choosing secure payment options i.e. Credit Card | Debit Card | Internet banking | PayU | PayUMoney | Paytm | PhonePe | Google Pay | Paypal with secure Gateway resources. # After successful order, PDF copy of Assignment will be deliver to you on email or WhatsApp. # Assignments are for help and reference purpose only. # Call | WhatsApp on 8800002552 | 8800397766 | 8800791663 | 9891869487 for any Assistance.